The Village of Mundelein and the Regional Transit Authority are working together on a study to figure out how to improve service along Metra’s North Central Service line — and figure out how to pay for those improvements. At the moment, the study is at the early stages. The contractor isn’t expected to be selected until this fall, and many details would still need to be hammered out. Once the contractor is selected, it may take as much as two years before the study is completed. But what is clear that increasing weekday service and getting more weekday service is a major priority. While having the line helped development, the municipalities believe that it can only go so far with the current schedule. Metra launched the North Central Service line in 1996. Between Chicago Union Station and the River Grove station, the line shares tracks with Milwaukee District West Line, but other than Western Avenue station, it doesn’t make any stops within the city. From there, it travels along the tracks currently owned by Canadian National Railroad to the Village of Antioch, stopping at Franklin Park, Schiller Park, Rosemont, Prospect Heights, Wheeling, Buffalo Grove, Prairie View, Vernon Hill, Mundelein, Libertyville, Grayslake, Round Lake Beach and Lake Villa. 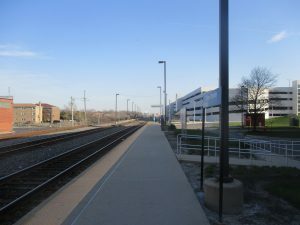 It is the only Metra line that has a stop anywhere near O’Hare International Airport, riders can transfer to Milwaukee District North Line at Libertyville’s Prairie Crossing station. While passenger train service ran along most of the suburban portion of the line until 1960s, according to Metra’s website, it was part of a more limited inter-city service. While that service stopped at some of the communities currently served by North Central Line, other communities — such as Buffalo Grove — didn’t have any kind of train service before. The service has been a boon for the communities. Metra’s website quotes Steve Lentz, who served as Mundelein’s mayor since 2013, as saying that the line kick-started his village’s downtown development. Lentz said that the station encouraged more commercial, office and residential development in what used to be an industrial area. He also noted that Mundelein used the station as a centerpiece of transit-orientated development. Since the line launched, Metra added a second track, reducing conflict with freight trains and allowing it to run more service. It also added stations. But a casual look at North Central Service Schedule reveals deficiencies. It is one of only two Metra lines that have no weekend service whatsoever, and it has fewer off-peak and evening trains than most lines. There is no service in either direction between 10 a.m. and 1 p.m., and most of the evening service is northbound. That means that if a rider wants to, for example, take an evening train from Buffalo Grove to Mundelein, they have no way of getting back. As Amanda Orenchuk, Mundelein Director of Community Development, explained to the Chronicle, those holes in the schedule hinder her village’s development. 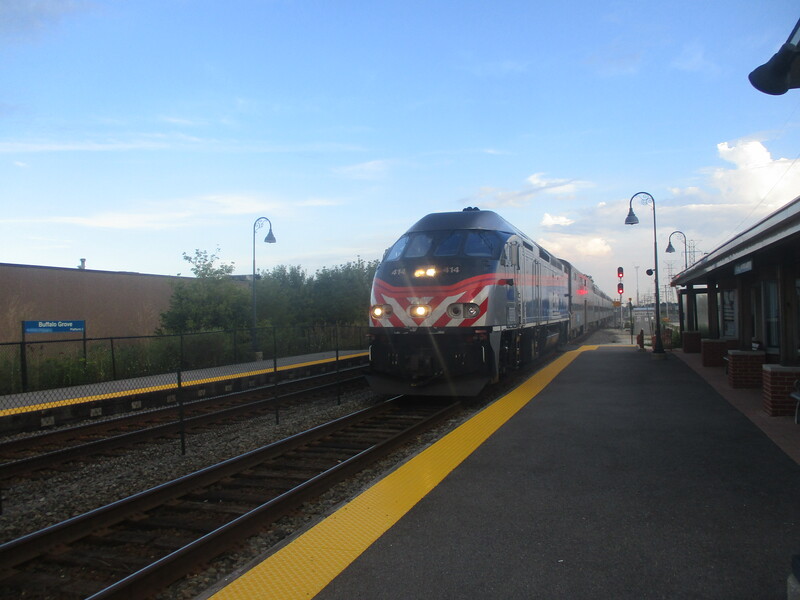 The Mundelein Metra Station is located near the village’s entertainment district, she said, and North Central Service line lacks service at the times when the district is the busiest — weekends and evenings. Part of this has to do with the line’s operations. Metra lines can be divided into three categories. On Metra Electric, Rock Island District and the two Milwaukee District lines, the transit agency owns the tracks and operates the trains. On BNSF Line and the three Union Pacific lines, the private freight railroad companies own the tracks, and they operate the trains under contract with Metra. And North Central Service, Southwest Service and Heritage Corridor lines fall into the third category — private rail companies own the tracks, and Metra operates the trains. In those cases, Metra has to negotiate with the track owners — in this case, Canadian National Railroad — on how often the trains can run. And because of the freight traffic volume, there is only so much room the railroad is willing to give in its schedule. That can be potentially resolved by adding more train tracks or sidings. 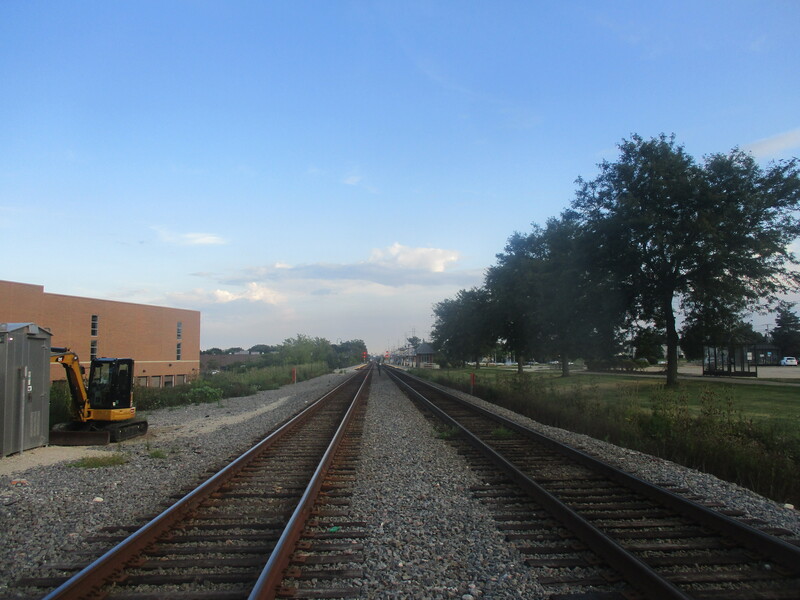 For example, Metra and Union Pacific Railroad have been working to add a third track on currently two-track segments of Union Pacific West Line. On June 29, 2017, the Village of Mundelein applied for Chicago Metropolitan Agency of Planning’s Local Technical Assistance grant. The grant uses federal funds to help local governments and nonprofit organizations with studies that would benefit the communities they serve. As Orenchuk wrote in the grant application, those kinds of improvements require funding that go outside the traditional mechanism. The village was inspired by Chicago’s Transit Tax Increment Financing District, which the Chicago City Council established by a unanimous vote in November 2016 along the stretch of the Red ‘L’ line between North and Devon avenues. Like other TIFs, the base value is determined. As improvements are made to the property within the TIF, the assessed valuation increases. Any increase over the base value is deposited into a TIF account that is used for economic development. The key difference in this case is that the money goes specifically toward transit improvements. What Mundelein was looking for wasn’t necessarily a Transit TIF of its own. Rather, it is looking to explore all the ways the communities along the line can work with the Metra and other transit agencies to come up with the funds. In addition to figuring out how to fund the improvements, the study would determine what exactly those improvements would be, how much they would cost and how they could be implemented. The study — officially known as Mundelein-NCS Corridor Study — was included in RTA’s 2018 community planning program. It received $50,000 in RTA funds and $50,000 in federal funds, with $25,000 covering the rest. Orenchuk said that funding came from the village’s discretionary funds. She emphasized to the Chronicle that it wasn’t just about Mundelein— the village wanted to do something that would benefit all the communities along the North Central Service line. And, indeed, the CMAP grant application included emails and letters of support from Rosemont, Prospect Heights, Buffalo Grove, Vernon Hills, Libertyville, Grayslake, Round Lake Beach, Antioch and Long Grove, as well as Lake County government and Lake County Transportation Alliance, a consortium of companies that help fund commuter bus service between Metra stations and their facilities. While most municipalities offered general statements of support, some went into detail. Joe Wade, Prospect Heights’ city administrator, wrote that North Central Service hasn’t been generated as much ridership and development as originally expected, especially compared to Milwaukee District North and Union Pacific Northwest lines, which serve the communities to the east and northwest of the line, respectively. “Mundelein’s proposal to examine barriers and identify opportunities for service enhancements would help to address the missed targets and goals of the line’s planning,” he wrote. LCTA President Suzanne Zupec described improvements to the line as a boon for Lake County businesses. Brian Hacker, RTA’s project manager for the study, told the Chronicle said that the entities involved will select a contractor by this fall, and the actually study would take around one to two years. He explained that many particulars of the study haven’t been determined, but it will involve outreach to area stakeholders, and public outreach will be “a vital component” of the study. As previously reported by the Chronicle, the City of Des Plaines is currently conducting its own study to determine the feasibility of building a station on the North Central Service line to provide easier access to O’Hare and the Union Station. Hacker said that he doesn’t expect the two studies to affect each other.